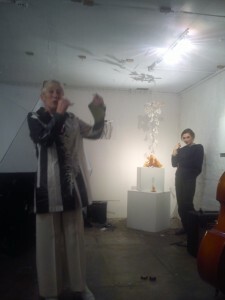 Jill invited artists, musicians, poets, writers and performers to explore their relationship to WHITE whether it be scientific, social, mythical, psychological, religious or aesthetic. Celebrating that split second of WHITEOUT – the imagination is accessed and the artist has the freedom to improvise. This was a great piece of work it was a shame it did not last longer after all the suspense. Still it was worth a trip to be there. A piece of theater without the actors. A stage which one becomes part of. We queued for about 5 minutes each to watch a short animation, sculptural install partly 3d modeling and partly real 3d objects called ‘Gaffer’ a Kinetic audiovisual installation. It required darkness for the effect to be visualized. It is not easy to describe but one felt that one was observing a mirror in 3 Dimension. The sounds were realistic and the lighting controlled the observation. Everyone received a private view of the installation. The gaffer tape was 3d design and strips were stuck around as it was projected with a realistic sound of tape. Check out their website you will see more of their work and also explanations on how the work has evolved into something very engaging. Thanks it was great is all I can say. The show will be at Tenderpixel until 11th January 2014 closed o15th December – 7th January. So there is still time to see the show. So if your in the region of Leicester Square pop in.